The influence of Delta Tau Delta has been felt in over 140 colleges across the country, with our mission and values having a key influence on the campus environment. It is for this reason that we are proud to announce that Delta Tau Delta will be returning to the campus of Wabash College after a seven-year absence. The returning chapter will reclaim their designation as the Beta Psi chapter, a chapter that was active on the Wabash campus from 1894 until 2005. The chapter shelter is still standing, and the college is excited about the return of the fraternity to campus. One of the key elements to making this recolonization successful will be alumni involvement. The influence and expertise of older Delt men will be extremely valuable as this chapter continues to build and grow. Alumni have two great opportunities to meet these men and be involved in the building of this chapter. 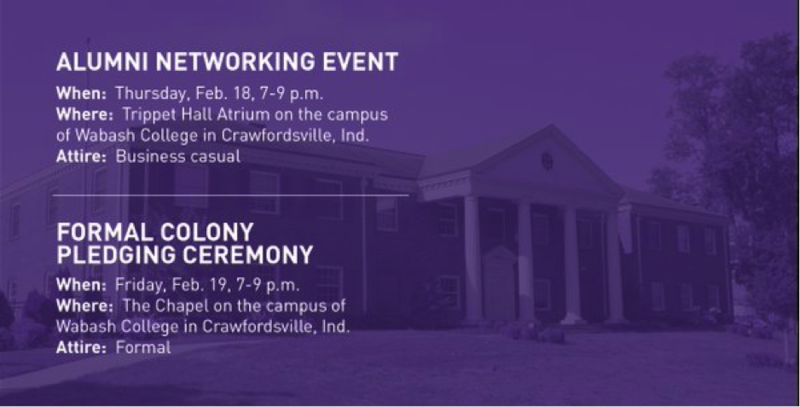 On February 18th, there will be an alumni networking event on campus designed to connect this new colony with their alumni brothers. The following night, February 19th, we invited you to attend the formal colony pledging ceremony. This is a great way to get involved in the future of Delta Tau Delta.